Priced at 2950php locally in Digital Hub and would sit in the low to mid end of the local IEM range where the competition is tough but very much in demand to the consumer. They come in a range of colors such as green, black, orange and blue, exhibit a nice tough wiring construct, a funky little CIA type ‘swirl’ in the left ear lead which helps for quick identification of left and right (its actual left and right are the same as tracks on the y junction). So does it meet my criteria for a nice throwaway IEM for outdoors and the gym? Is it tough, durable, a bass head dream, or is it a thin sibilant nightmare of an SC? Funky is the word with its clear plastic tubing. Definitely targeting the fashionista’s with the styling. The monotone complexion is a clubbing reference, but to the non clubber it does have fisher price type looks. Trust me this is so Euro clubbing it is almost a parody. Do I like it? funnily enough I am ok with it. It’s different and the color schemes such as black, orange, yellow, pink and green give you plenty of choice to mix and match. My orange ones do stand out a bit but the tips are color coordinated so that is a plus. The black ones also have orange tips FYI! You also get at the top and bottom a nice range of translucent tips which should give you more options and if you are buying black then may a set of these tips will give you a look more suitable than orange. One thing missing which at 2.9k surprised me was any sort of cloth or hard case. The plastic tube is just too big for carrying around for anything other than luggage haul. I think if there is a v2 maybe a soft pouch like you get in the tma-1 or Tracks would finish the package off. There is a secondary version with built-in mic presumably for the iphone crowd but honestly not something I am getting hot and bothered about. Excellent in a nut shell. Nothing too technical here, very solidly built and the wiring looks like it can take a beating. I am sensing Aiaiai have this toughness ethic built in as a core design principle since the same can be applied to the tracks and tma-1. The lack of moving parts and exposed swivels is something I would be very much looking for in an outdoors IEM. The toughened wiring is reassuring for outdoors usage no doubt. Now I am going to presume this is a CIA bodyguard inspired design move. You are gonna either love it or loath it. No in-between. Me I love it, its on the left lead, its easy to spot, no issues figuring out which bud goes into which ear. End of story ha ha. It does not serve any other purpose upon inspection. It doesn’t get in the way of anything or touches your ear so consider it a design quirk with a touch of practical application. Now previously I mentioned that the 3.5mm jack had issues with a grounding problem when you twisted it leading to distortion and feedback in the sound. I am pleased to say Aiaiai analysed this and reported to me that this was old stock and they have requested suppliers to take them out of circulation and update with new stock which is the one I have. No such distortion issues with the unit I have. Compared to some of the previous cheap IEM’s I have had at the 2-3k range these are much better. The soft pliable rubber tips have good isolation without grating on your ear. I once had a pair of 2k Philips and they just plain sucked, hurt the ear to no end and gave a tinny shrieking sound as a result – poor islolation and never fit in the ear. These worked perfectly first time with stock tips for me so this is a big plus. I have stayed away from IEM’s for such a long time because of the pain them Philips put me through. I also tried the Zune premium nylon cloth IEM’s for the old Zune 80 and they did very well also but the nylon cloth rubbing fedback into my ears so that didnt work so well during softer moments in my playback. 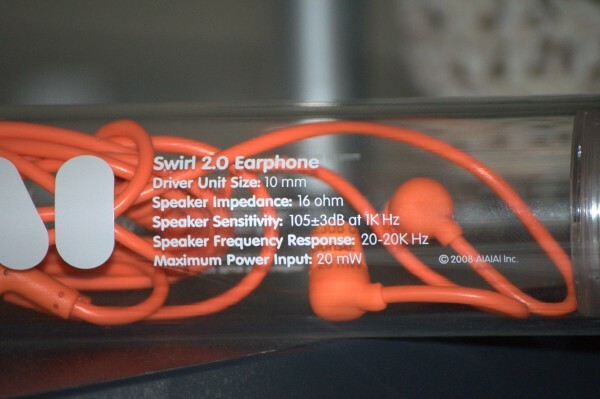 Compared to the Bose In-ears they hold their own for comfort, maybe an edge to Bose but then Bose has no isolation to speak off compared to the Swirl since they didnt go into the ear that much. Ok lets get down it to then shall we? For me its a 3k IEM, no question, but a fun 3k and I honestly don’t think, unless you were aiming for treble happy IEM’s, it would be 3k you would regret spending. For a start I am beginning to see an Aiaiai house sq develop having listened to all their products now bar the Pipes. Accent is on bass but more of a U shape in terms of sq with clean highs and slightly recessed mids. Yes of course no soundstage really, in the club feel being played in your head which when I slot on an IEM I always have to adjust to. Bass slam is excellent, and exactly what I expected from Aiaiai having heard the tma-1 and tracks. They really come alive on Dance, electronica and some ambient. One of my favorite reference tracks is Jam & Spoon – Right In The Night for its clean crisp Spanish acoustic guitar opening accented by nice deep bass thumps throughout and soaring female vocals. A really good test for this genre if though coming from 1994 the production levels are a bit antiquated. The Swirls do emphasize the lower end, particularly the underlying beat rhythm and this is what is so satisfying if your a dance nut – if your music is driven by phat beats then the swirl is great at throwing these around. But lets swing over in another direction – Megadeth – Hook In Mouth. Now the rhythm guitar is excellent as exepected when bass is the boss, but everything seems a little colored to the dark side. The trebles on this recording don’t have huge sparkle and the double drum and solo attack about halfway sound messy so I am not convinced they have the necessary capability to handle sources that require high levels of attack, detail and seperation. As we swing to treble, the resolution is not bad, certainly there no veil like the Bose, though a little less impressive compared to the thought gone into the lower end. For most dance it is essential that lows and highs are capable as this is where the magic of techno, house and general club music lies. If anything its a tad thin and limited for sources that require brighter top ends and more demanding use of the spectrum but totally at home on its core target genres where this is not such a big need. The mids are not outstanding, but to be expected to be honest. Nothing that would concern me at 3k but more recessed than I would have liked. Now play R&B, Dance and hip-hop your gonna say no worries, but switch to something a bit more delicate and it gets a little more challenging. Might have been the e7 but the tone was definitely very very warm and smooth, nothing piercing. I could easily listen to these without fatigue for more than a few hours. Tried them with Madeleine Peyroux – Bare Bones and it was so smooth and buttery it was almost melting lol. Slight veil but again not the infamous Bose veil level. I could say husky female jazz vocals would suit this IEM. I quite like them with female vocals though, suits jazz vocals IMO, nothing searing in detail and they are very forgiving of bad recordings. Dont expect mad levels of detail but they can be smooth as well as bassy when they suit. No sibilance! That is big plus for me. I hate it with a passion so after about 20 tracks tested I just can’t find any. Honestly a fun little IEM, with character, oddness and very much targeting the beat conscious generation with a heavy Euro accent on design and styling. ON this alone it should hold it’s own in the 2k-3k range and I tell you what they will kill SC stone dead lol. Durability is excellent for outdoors usage as well. SQ wise, average on most genres but then they leap up a couple of notches when you stick in the dance, R&B and hip-hop. This is what they are made for, they don’t shy away from that. You are into bass heavy dance, R&B and hip-hop and a warm presentation of female vocals in quieter tracks. If you think hearing a pin drop during a Kirk Hammett solo is the ideal way to spend a Saturday evening.